Two kinds of sweet potatoes, both delicious. This Spring I planted sweet potatoes for the first time. I'd certainly eaten them, and given some thought to growing them, but space in my garden often felt like it was at a premium. And past experience taught me that the potato can be a master of disguise resulting in a surprise second year harvest. One fine morning in May found me with gloves, hoe, hat, and Takashi-san at the field. He had already tilled, but the sweet potato beds still needed a bit of preparation. Using stakes and ropes we created straight lines along which I hilled the soil into a long mound where I later planted the slips. Takashi-san worked on another part of the farm returning periodically to check my progress and admonish me to work a bit slower to save my back. Ten rows later I was done and ready for lunch. The slips came bundled in newspaper, and we moved along the rows sticking them in the ground at intervals of about a foot and a half. Well, not really "sticking" but rather laying the slip (a sweet potato leaf and stem with a tiny root bud at the bottom) on the soil and then simply covering it up. Once the sprinkler system was up and running smoothly the days work was done. The field was watered in the early mornings and late evenings as needed. (Last year the Takashi's watered by hand, and decided that was the last time for that.) 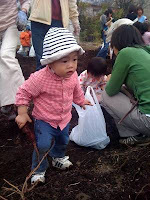 I asked about applying any compost or dung, but the Takashi's said the sweet potato only required regular watering. It made me think what a boon this vegetable must be in some ways. It required some work to get in the ground and some watering, but no additional compost or fertilizer. Just let it grow and a good harvest was nearly assured. Over the summer I would look over and see the vines stretching about the field soaking up sun and rain. Weeds grew alongside the plants, and in time the vines weren't even visible. I worried occasionally that the sweet potatoes weren't there any more - lost to the weeds or some unknown calamity that the Takashi's were too kind to tell me about - but then I remembered how clever and determined the potato can be and let it go. Last Saturday we harvested some of the biggest, most beautiful sweet potatoes I've ever seen. Well, I didn't harvest them at all, but rather a group of preschool children and their parents did. Decked out in rubber boots with trowels in gloved hands children ranging in age from a few months (in one case strapped to a father's chest in a baby carrier) to about five with parents lined up along the rows. The look on the faces of children and adults alike as HUGE purple sweet potatoes emerged from rich black soil was utterly priceless. Pure pleasure reigned supreme as potato after potato was added to piles all over the field. Kids dug for them like buried treasure and ran around holding them aloft. Kids ate dirt (and cried a little when finding it wasn't quite as tasty as anticipated), rolled in dirt, walked in dirt, and generally got dirty. It was great, and our faces hurt from so much smiling. We came away with a bundle of the beauties ourselves, and have been eating and sharing them since. Stew, steamed, baked in a neighbor's oven, and in dessert (bought at the grocery), the sweet potato is on every table and part of nearly every course at the moment. I've included my version of this original recipe I found on Epicurious years ago. It's a sure crowd-pleaser, and it tastes good the moment it's made. The orange juice base makes it good for warding off colds, too. Heat the oil in the soup pan, throw in the onion, and cook covered until the onion is well-cooked and soft. I find the longer I cook it (without burning it) the better. Throw in the garlic, ginger, and cumin, and cover again. Toss in the cubed sweet potatoes, stir, and add the orange juice. I tend to add orange juice until the mixture is covered and the sweet potato bits are swimming a little. Then I throw in the beans, and let it simmer along until the sweet potatoes are done.